The Cinque Terre is relaxed. It’s not the sort of place to race around with a checklist of sites and “must do” activities. Resist the temptation to set a cracking pace. Relax, breathe, rest, absorb and enjoy. Spend time seeking out and enjoying the little things – watching the ferries chugging from town to town, seagulls wheeling against the blue sky, or just enjoy the view. Trains between the towns will be late, buses up to the hilltop towns in the hinterland will not be running, or the ferries will be cancelled because of the weather. Expect loos at the train stations to be closed for refurbishment, restaurants to be closed unexpectedly. It’s OK though, it’s the Cinque Terre, take a chill pill, get with the dolce vita, relax and enjoy where you are. While I advocate this no matter where I am, in the Cinque Terre it is a must. Carnivores need to forget the red meat – fresh local seafood rules here – and is cheap! Great local wines (especially the whites) are a definite to try and definitely don’t miss the chance to try the local dessert wine of the Cinque Terre, sciacchetra (shar-cat-TRA) – delicious! Other local treats to try: pesto (yes, it is a Ligurian treat, so eat away! 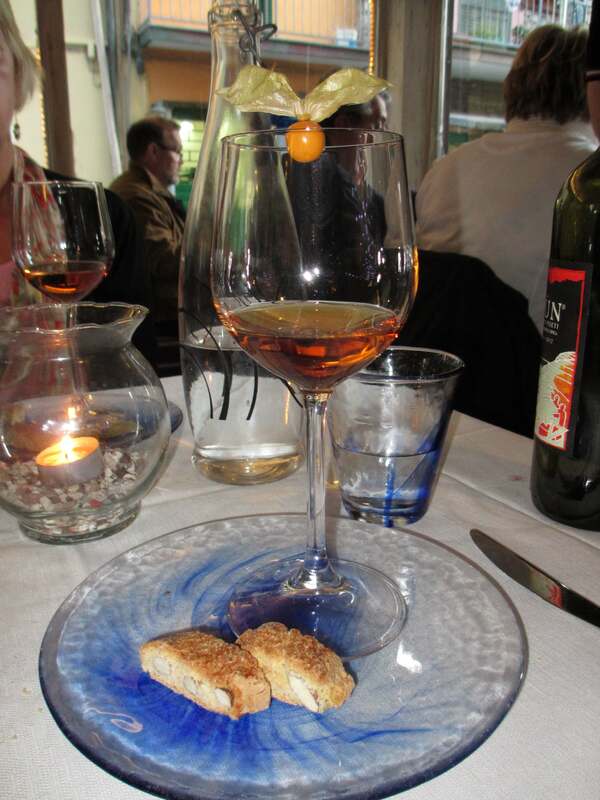 ), walnuts (delicious as a pasta sauce) and limoncello (lee-mon-chello) a strong lemon flavored after dinner drink. 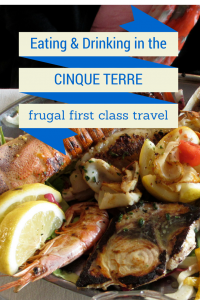 For more details on eating local in the Cinque Terre, see here. If you want 5 star luxury head to Portofino. The Cinque Terre is homely, small family hotel territory (there are a few bigger 4 starts in Monterosso if you are desperate.) Private rooms (camere) to rent abound. The almost no-English speaking owner of my hotel (a modest 13 room 3 star) made my morning cappuccino. His daughter manned the desk. Their dog was the star of the breakfast room each morning. That’s the spirit of the Cinque Terre. Local trains in the Cinque are long. Platforms are short. At many of the stations the train will stop and you will still be in one of the many tunnels. Pay attention, and if the train stops, and your town is the next scheduled stop, get off. Listen carefully to English language announcements at the stations. At some stations the platforms are actually shorter than the trains – the train doors will only open in the middle carriages, so listen, and congregate with all the other tourists in the middle of the train. Trains don’t run that frequently, so missing your stop and having to back track can waste a lot of your time. In spring the trains disgorge what seem like hordes of tourists who look hellbent on ruining your enjoyment and tranquillity. 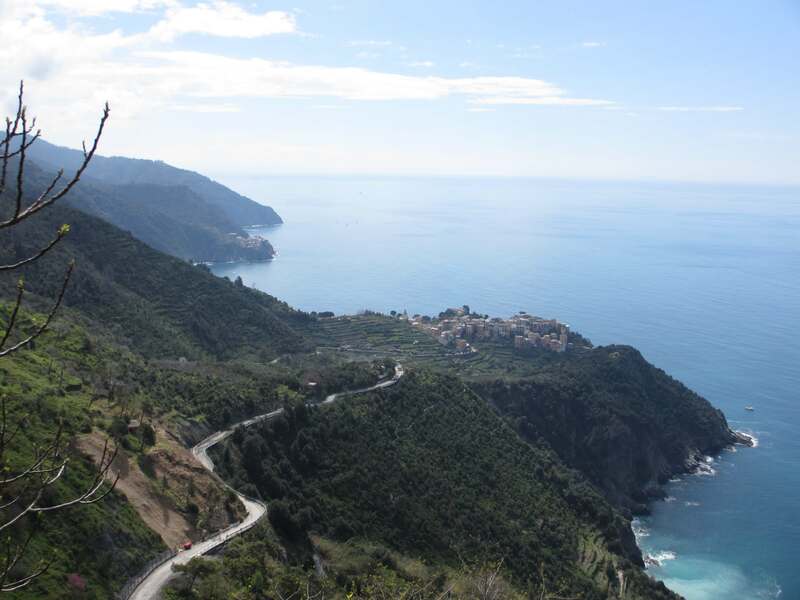 Don’t despair – while the crowds may seem terrible leaving the station, people disperse pretty quickly and it is possible to find your own personal, private Cinque Terre. Regardless of what town you visit, head off into the quiet lanes and away from the main drag. You’ll find your own private fabulous views, interesting architecture and a very personal experience. Do it first thing in the morning or later in the day and enjoy the lack of other tourists, the calm waters and the beautiful light. Late afternoon from the ferry is a perfect spot for some gorgeous photos as the light is just right to show the towns off at their best. I know I say this all the time, but really the Cinque Terre is one place where a small bag is a must. It’s hilly, there’s stairs everywhere. Smaller towns don’t have taxis and there are almost no lifts. You will be carrying your bag up stairs, and dragging/carrying it up steep hills regardless of where you stay. 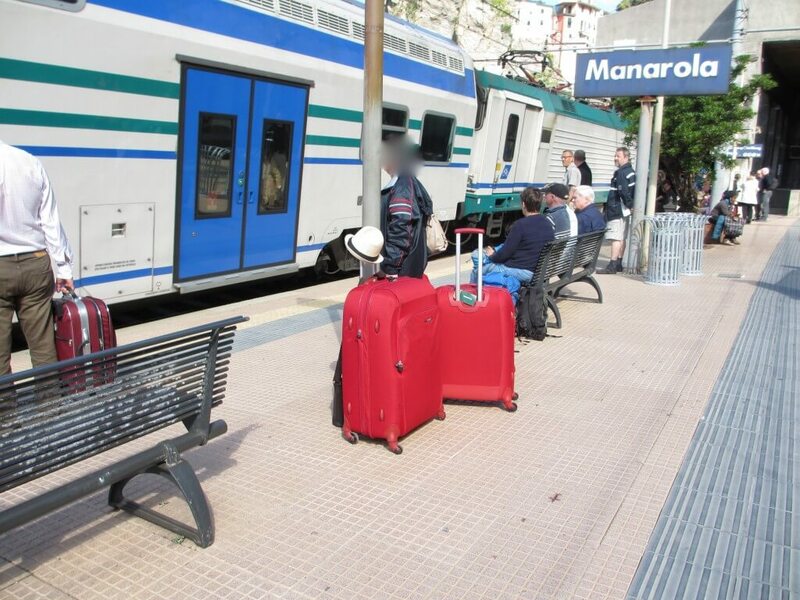 Trains are high and station platforms are low, so you need to plan to able to lift your bag up about a metre (3feet). Not all of us are hikers – myself included. There are still plenty of opportunities for walking around the towns and their outskirts and country walks not on the hiking trails. As I write, a number of the easier paved walking paths remain closed due to the awful 2011 storms and other adverse weather events. Even so, a non-hiker like me still found plenty of opportunities to enjoy the views, the hillside terraces and the country side. I’ll be writing about walks for non-hikers in a future post. 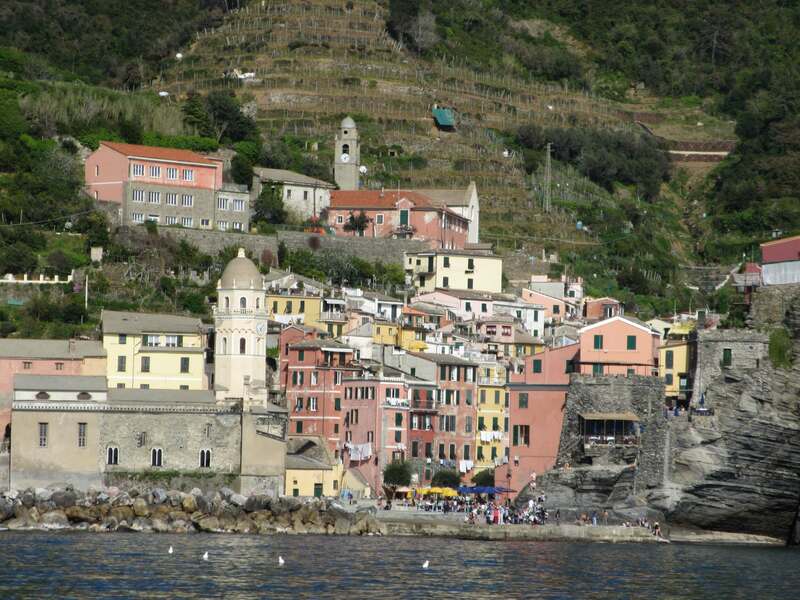 If you’ve been to the Cinque Terre, what are your suggestions for enjoying your stay? 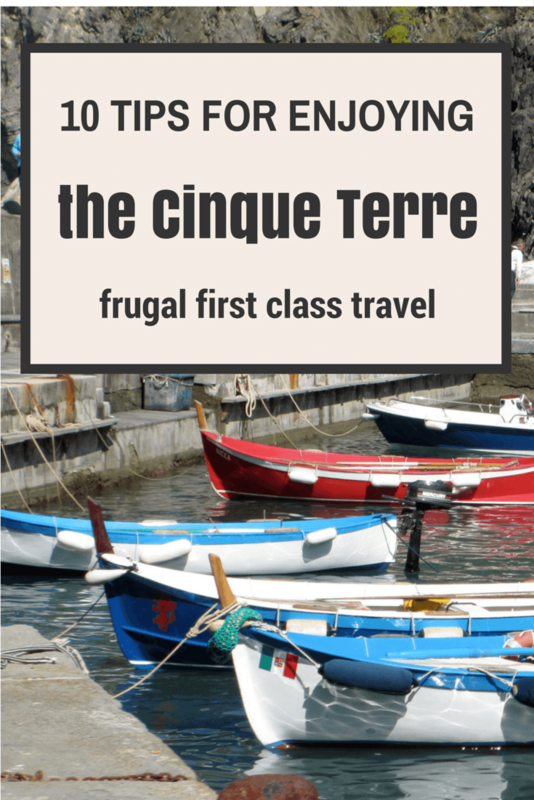 For the perfect guide book to the Cinque Terre click here. This will take you to Amazon.com and I do earn a small commission if you choose to make a purchase. 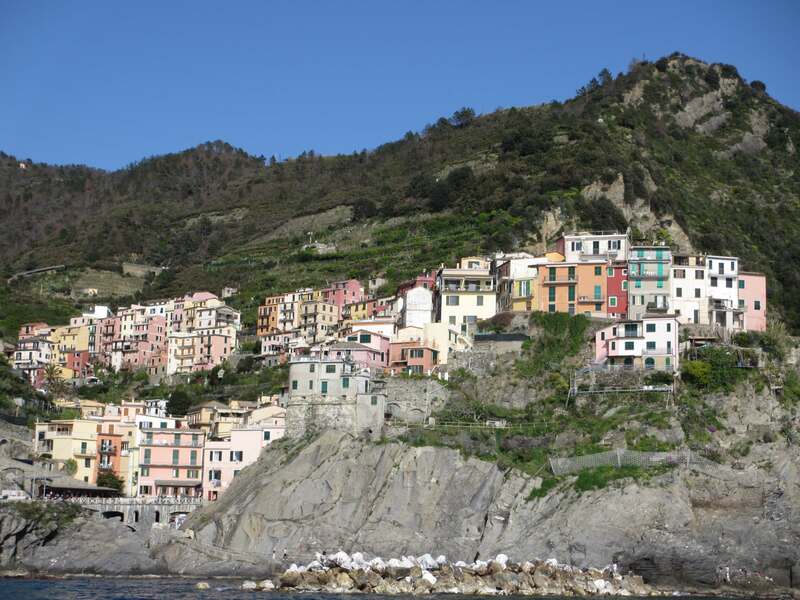 You can also make a booking for the Cinque Terre on Booking.com, my preferred booking site for hotels. Fantastic post! Thank you for the wonderful tips, especially about how the trains are long but the platforms short – so get off when it stops before your destination. And about how they exit from the middle – look for the crowd preparing to depart. Those tips alone probably saved me from missing a station on my future trip. You have helped me to plan a much better trip. Thanks Roberta. It’s always great to hear that I’ve helped with some useful information. I’ll be doing a series on the Cinque Terre looking at eating and drinking, walks for non hikers, day tripping to Portofino and accommodation options as well as a couple of more reflective pieces. 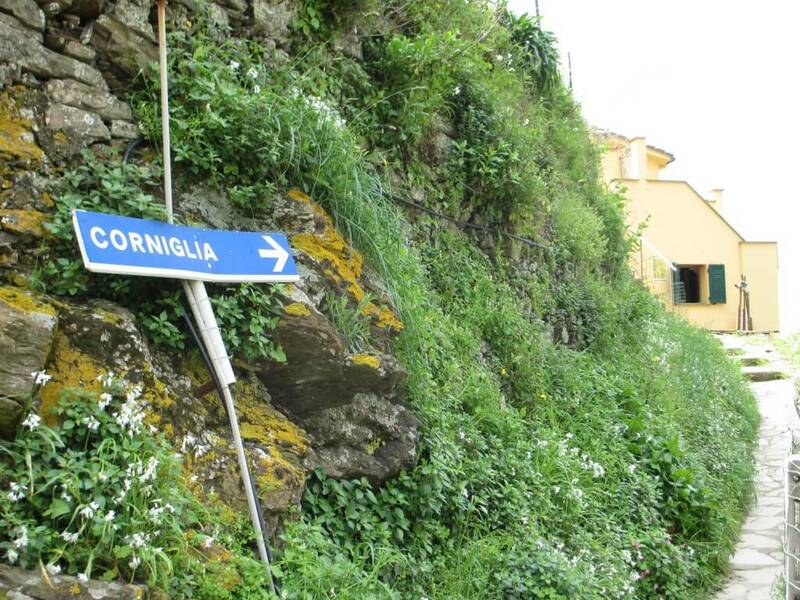 What helpful tips to heed to make the most of any journey to Cinque Terre! It certainly sounds like my kind of place…slow travel…slow eating…the ideal way to experience Italy. Sign me up! Yes, that’s a good way to think about it – slow. Great information! This area has been on my list since the first series of Time/Life cookbooks (in the 60’s I think it wasthat they published some photos). Hoping to get there next year and your series will be invaluable. Thanks and for your whole blog. Thank you, that’s so kind. You will have a wonderful time and it will be well worth the wait! 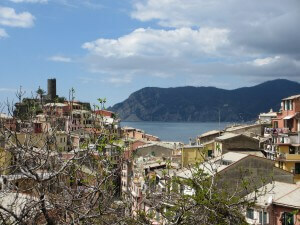 Jo, thanks for a great article about Cinque Terra! Fabulous tips! Will put them to good use when I visit Cinque Terre – not sure when I will be going, but it is on my expanding bucket list! Thanks Anita! 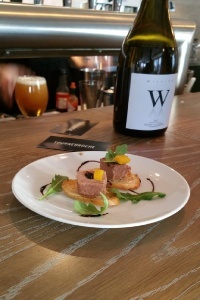 I’ve also written about eating in the CT and have got a couple more planned. Day trip to Portofino anyone? Great blog! thanks for the advice. I wonder if school holidays will make a difference in the amounts of poeple going – any advice on timing for a quiet time in late summer-autumn? Thanks for the feedback. I was there in late April. It was very busy, especially on the trains, but people dispersed pretty quickly into the villages and it was pleasant to get around the villages and enjoy them. It was easy to get tables at restaurants for dinner. The last day I was there was a public holiday in Italy and it was noticeably busier everywhere with Italian families out to enjoy a day near the sea. I suspect it’s like anywhere popular in Europe – avoid high summer and public/school holidays and go for spring and autumn instead to avoid the big crowds. I’ve always wanted to visit the CT, which village/town would you recommend most of all? They are all so close together, you need to visit them all. Monterosso has more night life, but the others have a more villages feel. I stayed in Manarola, and thoroughly enjoyed it. Thanks for dropping by and taking the time to comment! My daughter and I want to take our first trip to Italy. This looks perfect! We want economical and laid back. Do you recommend a rental car or just taking the train? I travel alot by train in Italy and have always found the system works well. I also have a series of posts on Eurail passes that you can access by searching my home page. Good luck, and happy, safe frugalfirstclass travels! Such good advice for the Cinque Terre. So many of the things you cautioned about actually happened during our visit, eg ferries weren’t operating because of rough seas, delays in local trains, an Italian wide rail strike (our hotel warned us but lots of other visitors staying elsewhere had no idea), landslide blocked path between two villages. An even worse event: two honeymoon couples, separately at same beach (Manarola, from memory), different times of same day, were washed away. The husbands were both drowned. Very sobering, we kept out of the water even though weather was sunny and bright. Wow, Pamela, what an experience! Thank you for sharing your important information about not driving in the Cinque Terre. Having toured around I knew about the parking, but not about the state of the roads and the competition for road space! 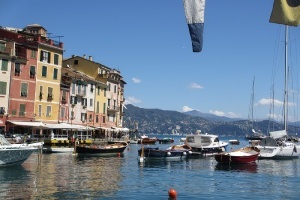 The Portofino post is up if you do a search on the blog. Thanks as always for your valuable contribution! A really good article! I so want to visit here, and soon. There are so many places on the list, but none top this. I am going to share this with my wife, who, by the way, shares your name. We spent a few days in Cinque Terre, exploring these beautiful gems. However, because we were traveling all over Italy, we had a rental car (which, as you know, can’t be taken to any of the Cinque Terre villages). Instead, we stayed at an Airbnb property (Casa Lili) in La Spezia, 15 minutes away from the train station. 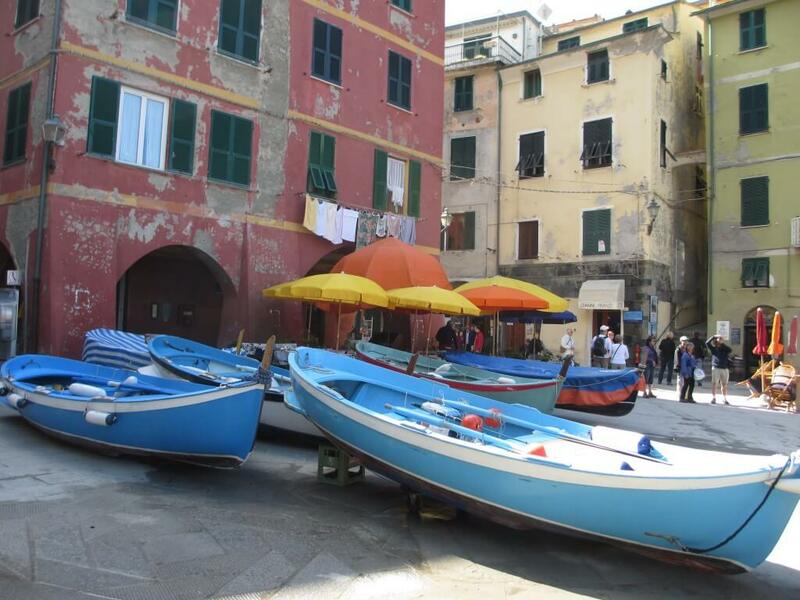 It was easy to enjoy Cinque Terre, without losing much time at all, and with no luggage to cart around. 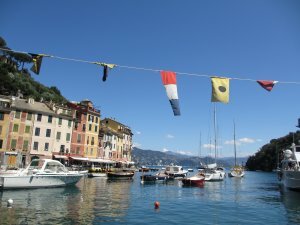 We still enjoyed hiking, dining, souvenir shopping, and taking photos all over Cinque Terre while staying overnight in La Spezia. Just another option that really worked for us! You’re right Tami, if you have a hire car you really need to stay in a town just outside the Cinque Terre villages. I loved being able to stay in the village overnight, and get up in the morning when everything was quiet and there was no one else around. Your suggestion is a great option if you are hiring a car and traveling more extensively in Italy. We had an incredibly wonderful experience. Forget the trains or taking a car. Plus the hiking trails between the towns were closed. So we stayed in an Airbnb in La Spezia, which is a wonderful little town to the south of Cinque Terre. There are passenger ferries that leave there in the morning and stop at all the villages of Cinque Terre except Corniglia, which has no port (hilltop). You can get on and off the ferry as many times as you want all day, stopping to visit the villages. And you get great views of each village from anywhere on the boat as you come in to dock – why travel through tunnel after tunnel along the mountainside where you see nothing, especially if you are not on the right side of the train? The cost for the whole day of travel was around 25 Euros. We spent about 6 weeks total in Italy and this was one of our favourite days. 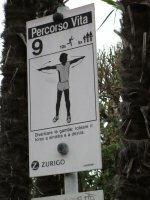 There is also a lovely beach resort area just south of La Spezia which you can reach by local bus. 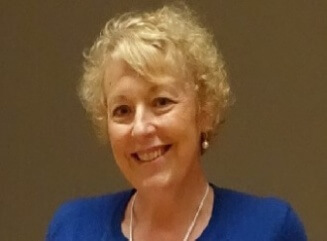 Excellent feedback and addition to the collective wisdom Elaine. The ferry certainly does give you a very different view of the villages and is thoroughly recommended. My tip: Find a bar with a sunset view and watch the sun go down as you sip on an Aperol Spritz. I’ve become quite a fan of this drink since visiting Italy last year. Perfect for a hot day. Yep, an Aperol spritz and a view is perfect. Having said that, the local red wine is also a top choice.